You think it’s an inconvenience when your car breaks down on the side of the road? Imagine that happening to your ship in the vacuum of space. 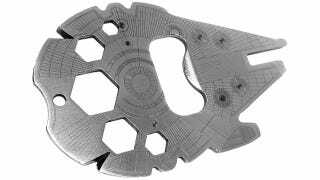 That’s why you always need to keep the right tools for emergency repairs on hand, whether it’s a handy walking carpet named Chewbacca, or this Millennium Falcon-shaped multitool.